Add some instant glamor to your store with a 48 inch Wide Extra Vision Showcase. 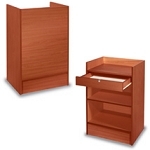 Tempered glass sides, top, and front will allow all to see your high-end merchandise. White interior and a 6 inch black toe kick on this glass display put all the attention on the contents within. Two rows of 3/16" split glass shelves are adjustable to fit your needs. 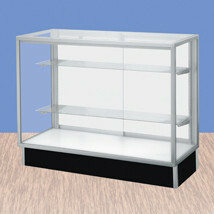 This display case is also available in a 60" or 70" width version. Order your glass retail display today!